AUTHOR INFORMATION: Robert Bennett Jackson currently resides in Austin, Texas. His attempt to write books began with an early fascination with Stephen King books shared by him and his brother. Mr. Shivers was Robert's debut and since then he has gone on to write four more books that mixed several genres & have defied classification in as many years. OFFICIAL BOOK BLURB: The city of Bulikov once wielded the powers of the gods to conquer the world, enslaving and brutalizing millions—until its divine protectors were killed. Now Bulikov has become just another colonial outpost of the world's new geopolitical power, but the surreal landscape of the city itself—first shaped, now shattered, by the thousands of miracles its guardians once worked upon it—stands as a constant, haunting reminder of its former supremacy. FORMAT/INFO: City Of Stairs is 464 pages long divided into nineteen titled chapters and three interlude text sections. Narration is in the Third person via Shara Thivani, Sigurd, Turyin Mulaghesh, Pityr, Morotka, Cheyschek, Vod Drinsky, and other personas. 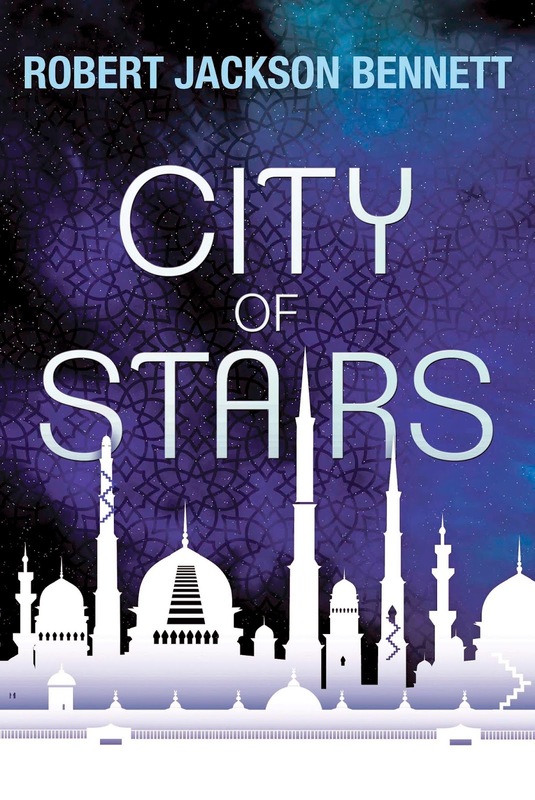 City Of Stairs is the first novel of the Divinities series. 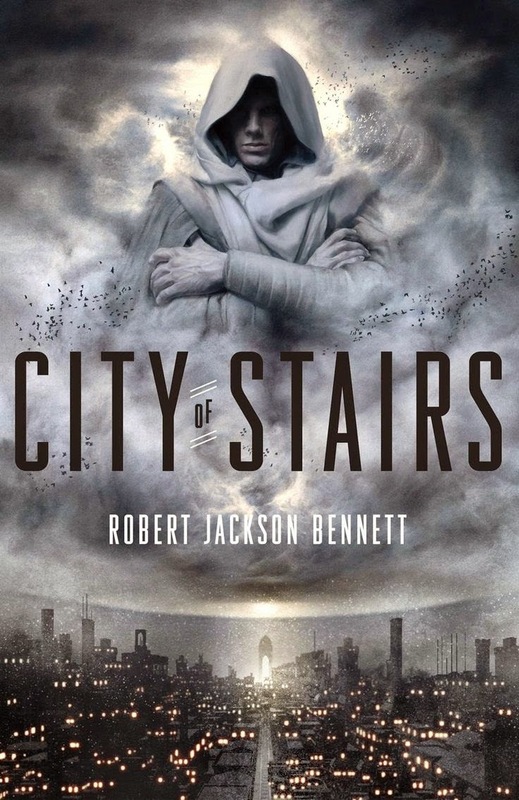 September 9, 2014 marked the North American trade paperback and e-book publication of City Of Stairs (see cover below) via Broadway Books. The UK edition will be published on October 2, 2014 in both hardback & e-book format via Jo Fletcher books. ANALYSIS (Mihir): City Of Stairs was one of those books that I was intrigued about when the author spoke about how history affects perception and the lives of those living in a city that previously ruled the whole world, oh and also the bodies of dead gods being used as WMDs! After finishing the book earlier this year, I felt this was the first standout out book of 2014. I'm usually a sucker for stories that sound weird and have cool blurbs such as the one above. To back it up, the author also spoke a bit more about the story's conception over HERE & HERE. Plus I had read the author's previous works which was excellent (American Elsewhere) & not-so-good (Mr. Shivers). This was the author's first stab at something other than what he had written so far. The story is set in Bulikov, the aforementioned City Of Stairs and erstwhile de-facto capital of the world (or atleast that's what the citizens would have you believe). Bulikov is situated in the continent with several other divine cities, it however is conquered by Saypur, a crumbling outpost which nearly eighty years ago did something so outrageous that it shook the foundations of history and literally changed the world. A man titled Kaj, slew a god via his machinations in the battle famously known as The Night Of The Red Sands. After which he sailed onto the continent wherein he further slew the remaining gods. Thereby destroying the continent's rule on the world and establishing Saypur's ascendancy as the supreme power. Of the many excellences that this book has, none is supreme than the world-building encompassed within. The author has taken pains to create a world that is magical, technologically oriented and sincerely refreshing in more ways than one. Six gods there were: Olvos, Kolkan, Jukov, Ahanas, Voortya, and Taalhavras, their wonders elevated the continent but now their age has gone and it left to diplomats and spies to manage the world. These gods had their own cities that were labelled by their divine names plus "stan". The world-building and the current state of the world is the remarkable part of the story possibly even better than the terrific characterization. Kudos to the author for eschewing pseudo-European templates and creating a world that's complex as our own and incredibly diverse. I couldn't help but wonder at the role-reversal effected by the author in this tale wherein the brown people are the conquerors and have in effect stymied the rest of the world with their scientific progress. The names and locations have a certain Indian & Russian feel to them & I hope to clarify more about this with the author in his interview with us. After acing the world-building component, Rob J. Bennett brings us down to the action via Shara Thivani and her secretary (this is a complete misnomer for him) Sigrud. As they try to figure out what is happening behind the scenes. By the way Sigrud truly is a memorable secondary character, his actions and past truly make the scenes come alive whenever he's featured and I sincerely hope in the future books that the author dwells into his past and future. Shara is a remarkable protagonist as it's through her eyes we come to experience the disheveled state of diplomacy and the many sacrifices it demands. The author doesn't stop at these two and gives us a strong secondary character cast beginning with Governor Turyin Mulghesh, who provides some of the black humour in the book with her sardonic observations. The divinities described are also rich and diverse in their viewpoints and it was fun to read about them and their wills. Lastly there are a few mystery threads to this plot which the author very efficiently unveils and the reader will enjoy all the revelations that are laid bare about the characters, the gods and what exactly happened with the Kaj & his deicidal efforts. All in all, this book is a rich secondary fantasy story that again is hard to classify whether it's is epic fantasy or a spy story in a fantasy world, or something else. I honestly feel that this book has so many dimensions to it and the more you re-read, the more you find. ANALYSIS (Liviu): City Of Stairs is billed as epic fantasy and has clear hints that it will follow its usual storyline, but also accompanied with a very unusual world building that shows the potential of the genre if it moves away from pseudo-medieval Western/east Asian, wizard incantations/spells, trolls, elfs, the dark, the others and the like and tries to show magic as sense of wonder in the sfnal way. I'm curious where it will go and how it will work in the end, but very intriguing so far; a world with trains and telegrams, but also remains of magical artifacts large and small, mundane and truly weird, while the geopolitics is not the usual pseudo-medieval Western/east Asian either, having a mixture of mostly Indian and Russian sounding names so far, really compelling. On the other hand this book balances finely between "now that's over the top" and "this is arbitrary and anything can happen anyway so why do we care" as it plays its internal logic against the logic of the genre which it ultimately follows, however well - talking about examples and how this balance is fine, the failures (mostly by repetition) of The Iron Council and The Black Bottle show how hard is to keep being innovative and I am curious if the author plans to write more secondary world fantasy, whether in this universe or another. As lots of things happen and I wouldn't want to spoil the twists, I would just mention that there is everything one wants - drama, romance, battles, fights, mysteries, amazing world building and great character who stay with you and not surprisingly this one vaulted to my top fantasy of the year for now and while it may not stay there as competition heats up in the summer (D. Wexler, A. Ryan, B. Weeks etc), I would say a top ten is guaranteed. On the negative side a few small things - the use of the word "fascist" which is a specific Earth world coming from Rome, fasces etc so deeply contingent of our particular past is really annoying, the world feels on occasion a bit small, while as mentioned the logic of genre still applies and the villains are villainous, heroes, heroic etc but nothing compared to the wonders inside. "368. Shelf C5-158. Glass of Kivrey: Small marble bead that supposedly contains the sleeping body of Saint Kivrey, a Jukoshtani priest who changed gender every night as part of one of Jukov’s miracles. Miraculous nature—undetermined." "369. Shelf C5-159. Small iron key: Name is unknown, but when used on any door the door sometimes opens onto an unidentified tropical forest. Pattern has yet to be determined. Still miraculous." "370. Shelf C5-160. Bust of Ahanas: Once cried tears that possessed some healing properties. Users of the tears also had a tendency to levitate. No longer miraculous. " "371. Shelf C5-161. Nine stone cups: if left in a place where they receive sun, these cups would refill with goat’s milk every dawn. No longer miraculous." "372. Shelf C5-162. Ear of Jukov: an engraved, stone door frame that contains no door. Iron wheels on the base. Speculated that it has a twin, and no matter where the other Ear is, if the doors are operated in the correct manner one can pass through one door and come out the other. We speculate that the twin has been destroyed. No longer miraculous." "373. Shelf C5-163. Edicts of Kolkan, books 783 to 797: fifteen tomes mostly dictating Kolkan’s attitudes on dancing. Total weight: 378 pounds. Not miraculous, but content is definitely dangerous." "374. Shelf C5-164. Glass sphere. Contained a small pond and overhanging tree Ahanas was fond of visiting when she felt troubled. No longer miraculous." CONCLUSION (Mihir): This book is the overwhelming fantasy favorite for 2014 and all others will have a hard time to eclipse it in my list. I'm glad Robert J. Bennett is also writing a sequel to this, because I truly can't wait to read more about this strange world and the three-dimensional characters that inhabit it. Re: The use of the word fascist. An inelegant word choice? Maybe? However, explaining that concept without that word takes a lot of effort and time to get it across properly. Also, bear in mind that a novel in a secondary world is by definition a translation. I am not at all convinced that the "tea" in this world is precisely what we call tea.